On January 7th, we asked you to vote on the most improved PPC program of 2007. Your votes are now all in and I wanted to share the 76 responses. Overall, most of you felt Yahoo Search Marketing was the most improved PPC program of 2007. Yahoo launched Panama, the code name of their new PPC program, in October 2006 but really didn't start having Overture account (the old PPC system) migrated for a few months after that. 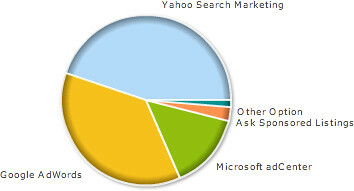 Yahoo, in 2007, began also migrating the new system worldwide. Yahoo's new PPC system is a total overhaul of the old Overture system, and that is why most feel it is the most improved. As you can see, Google came in a fairly close second. Google has made several significant upgrades to their AdWords system, including dozens of quality score updates, smart pricing, demographic bidding and much much more. Thank you for taking the poll. Continued forum discussion at Search Engine Watch Forums.